This weeks Glam Tip comes from Make Life Lovely and I had to post this one because I know every lady that likes make up has experienced a broken eye shadow, powder or blush. For me I try to salvage it but gathering all the broken pieces and using them. Such a hassle & it can get very messy. But I’m not the type to just throw it away either. So here is a way to fix your broken eye shadows, powders & blushes in 3 Easy Steps!! Put a few drops of Rubbing Alcohol into the shadow, powder or blush. An easy way to do this is by using a dropper to ensure you don’t use too much alcohol. 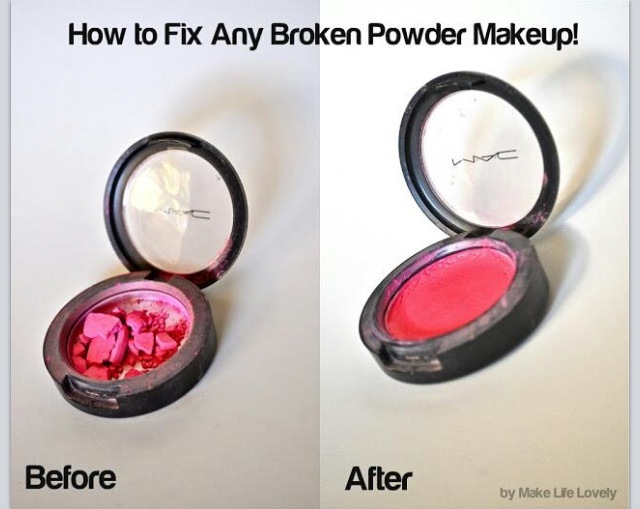 Use a a spoon to smash the broken and loose compact powder back into the flat form of the compact. Let the powder sit and settle for 3 to 4 days! It’s that simple! Also a fun thing to do would be to combine or mix colors to make a custom look if you dare to be that bold! I have so many powders i could have done this with over the years! Such a good tip…thanks! This is such a great tip! I have a MAC blush that needs fixing :).